It’s been an amazing year at PHS. We launched new services, a new website, a new membership program, and a new integrated library system. We made significant improvements to our building and computing systems, our financial procedures, and our fundraising efforts. And all of this happened while taking more church records on deposit than ever before and giving more help to in-house researchers. Below is a non-exhaustive--yet pretty long--list of accomplishments we’re particularly proud of. Have a read or just click on the links to see related web sites and real-time social media posts. The year’s not over, and already we’ve fielded nearly 3,500 inquiries at our building, over the phone, by mail, or by email, with in-house researchers using our reading room for a total of 662 researcher days—a six-year record. All of this highlights the richness of our holdings, and the many ways our staff has helped visitors explore and add to them in 2014. We set all-time highs in records management  responses (359, far surpassing last year’s count) and kicked off our genealogy research service  with 63 paid requests. PHS helped the PC(USA) and other national organizations by making house calls in 2014, traveling to Washington, D.C., to sort, pack, and ship scores of boxes from the National Council of the Churches of Christ in the U.S.A; swooping into national agency headquarters in Louisville to sort, pack, and ship over 140 cubic feet of permanent records; and delivering records management and digital preservation advice to the Presbytery of New York City , the Association of Presbyterian Administrators, the National Association of Church Business Administrators, and the Association of Stated Clerks. We delivered workshops at Fall Polity in Louisville and new stated clerks training webinars. At the General Assembly we hosted a sold-out PHS luncheon featuring Bradley J. Longfield, author of Presbyterians and American Culture: A History , and in September welcomed friends from closer to home to Old Pine Presbyterian Church in Philadelphia for “In the Midst of Them: Shaping Sacred Spaces .” That was a much shorter trip for us, but still entailed months of planning and coordination between attendees, staff, and panelists, including former GA Moderator Bruce Reyes-Chow and current Vice Moderator Larissa Kwong Abazia. Some help from our friends at the Board of Pensions IT, 2014. Continuing our tradition of sharing Presbyterian history as widely as possible, we awarded four Heritage Preservation Grants  to congregations—one of them with support from #GivingTuesday donors —as well as two Research Fellowships. We broadened our online sharing through social media (approaching 1,000 Facebook , Twitter , and Instagram  followers) and our monthly PHS Matters e-newsletter . We mailed our print Presbyterian Heritage newsletter to more PC(USA) churches than ever before and continued to provide high-quality scholarly content to subscribers of The Journal of Presbyterian History . Since the spring completion of our redesigned website , remote visitors have engaged with our collections, blog posts, and online exhibits  in faster, more user-friendly ways. The months of hard work the staff put into launching the new website has proven well worth it. Since the 1940s, PHS has maintained microfilming programs . In 2014, we responded to the growing desire of churches to own high-quality digital copies of their records by investing in a planetary digital scanner. 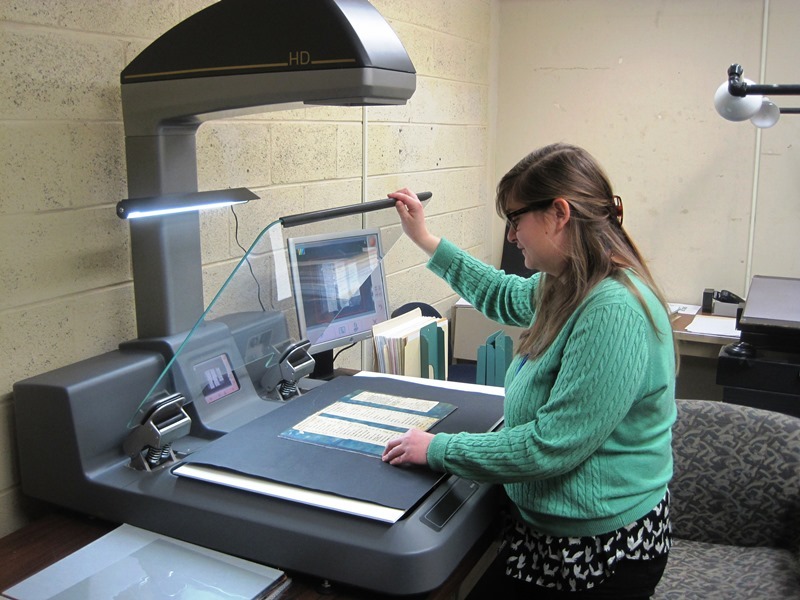 Having shot our last reel of microfilm  in August, we now produce and preserve volumes of records and other vital historical texts in full-color, high-resolution PDF documents. Stephanie using the CopiBook scanner, 2014. PHS migrated its digital library catalog, lovingly referred to as “Calvin,” to a new integrated library system  in October, allowing staff to modernize our records as well as the services and information we provide to patrons. Additional technological advances were made with more than a little help from our friends at the Board of Pensions , who helped us significantly upgrade our network resources and separate staff and patron network traffic, thereby improving the flow of work and security. In 2015, we will continue working closely with the BoP IT team to move PHS network data to servers at their data center, achieving additional storage and a higher level of security in a cost-effective way. One of the challenges of maintaining our long history is an increasingly historic building. Toward this end we’ve added a new boiler and chiller pump for temperature and humidity regulation, better interior lighting, and new security system capabilities including additional cameras. As part of our brick pathway renovations slated for 2015, donors are purchasing bricks to dedicate with personalized inscriptions along Heritage Walk . We’ve also taken an important step toward implementing a comprehensive preservation plan that will protect the many historic items inside the building, winning a Track 1 Preservation Grant assessment from the Conservation Center for Art and Historic Artifacts . This grant is helping us identify and meet challenges to the long-term care of our vast collections. Digital improvements have also made it easier for PHS to carry out business with researchers, churches, and vendors. We’ve implemented QuickBooks  Accounts Payable and Receivable systems that allow us to electronically send and receive invoices, payments, and payment reminders. Managers across departments can now sign invoices electronically and send them directly to the Accounts Payable mailbox, with each invoice being uploaded directly into the Web Invoicing System, greatly reducing staff time allocated to the process. 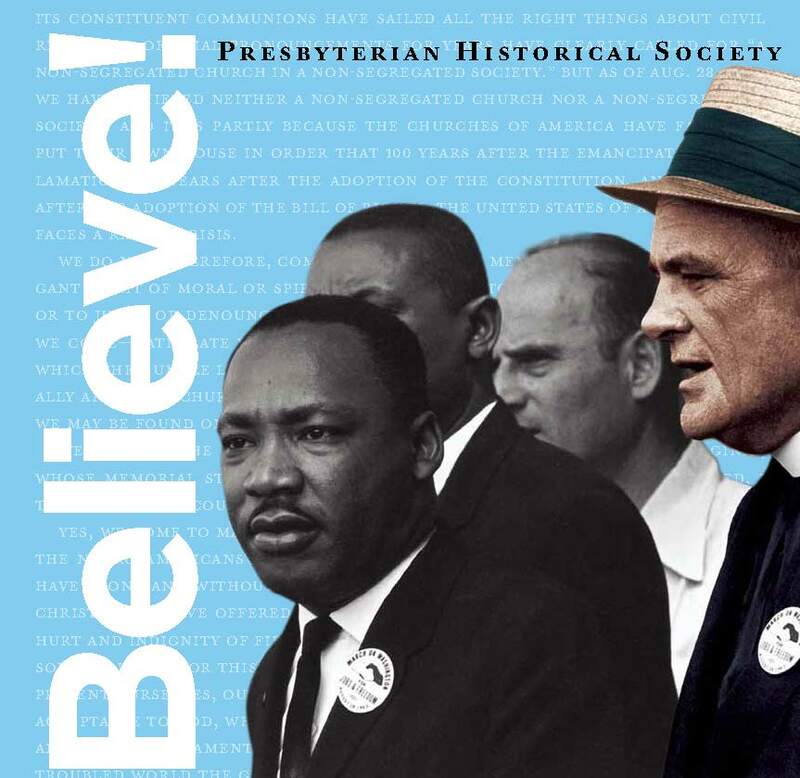 Cover of Membership Brochure featuring Dr. Martin Luther King and Eugene Carson Blake, 2014. In addition to the per capita apportionment we received from the Office of the General Assembly in 2014, we’ve been blessed with hundreds of contributions from donors--individuals, churches, and other organizations that believe in our mission to collect, preserve, and share the history of American Presbyterianism. Our new membership program  has broadened our fundraising base, as has our Board of Directors pledging $40,000 toward new gifts . We’re very close to meeting that goal, which you can help us achieve by making a donation before the end of the year. If you’re looking for other ways to show your support for PHS, and all we’ve accomplished in 2014, check out our Adopt-A-Document program  (which this year preserved letters from the Whitman missionary party to Oregon Territory), Cortlandt Van Rensselaer Planned Giving Society , and Online Archives program --one of the big initiatives we’re looking forward to celebrating at this time in 2015. We are so grateful to serve the cause of Presbyterian history and for all the support we receive. Thanks to everyone for an amazing year!